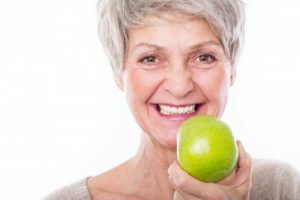 Consider Everything About Dental Implants in Fort Worth! If you have missing teeth, you must think about a few different things: aesthetics, function, longevity, and even the consequences that come with not replacing your teeth. What’s most important to consider is what you will gain from choosing the perfect teeth replacement, like dental implants in Fort Worth. Learn more about dental implants and everything they have to offer in this week’s blog post! Why are dental implants in Lawrenceville a better option than other restorations? Teeth have been coming and going for years now. Although it’s not ideal, you’re not the first person to have ever lost their natural teeth! Dentists have tried just about everything under the sun to create tooth replacements, but none of the past or traditional restorations amount to anything that dental implants have to offer. Now, your dentist in Fort Worth can replace both the critical root (below the gum line) and the crown (above the gum line) of a missing tooth. This works to address the beauty of your smile and the health consequences that could come with missing teeth, like bone loss. Dental implants are tiny titanium posts (they look like mini screws) that mimic the root of your tooth. By replacing your tooth root, helping your local dentist to give you more than just a gorgeous smile, you’ll experience 4 major benefits. Your dental implants work to keep your jaw bone strong. As mentioned above, you can avoid bone loss because the implant post acts as your missing tooth root. Dental implants will replace your teeth for a lifetime. Because of their two major parts, dental implants provide the most stability to keep your replacement teeth for a lifetime. Dental implants help you avoid the consequences of tooth loss. Both parts of the dental implant work to restore your aesthetics and promote a healthy mouth. Dental implants will boost your self-esteem! When you replace your teeth with a restoration that looks and feels like natural teeth, you’ll gain a smile that you can’t stop showing off. It’s true that you can replace teeth in different ways, but have you considered everything before making your dental restoration decision? If not, you could be missing out on a great opportunity to work with a Fort Worth dentist that offers effective, long-lasting dental implants. Here at West 7th Smiles, our dental team knows that it’s extremely important to replace your teeth that are missing—but we don’t recommend making a hasty decision without a consultation or research. After all, we work to prevent problems with permanent solutions! Feel free to learn more about how we can help you replace your missing teeth and improve your smile during a scheduled consultation! Comments Off on Consider Everything About Dental Implants in Fort Worth!